What’s a match in Sri Lanka without the drums and the trumpets adding to the mood? The home team had atmosphere and a good group of supporters on its side, led by Shashikala Siriwardene, the former captain who is sitting out with an injury. The spirits were as peppy as the music and pom-poms outside the boundary ropes. That attitude and an inclination to play with freedom won it the day when up against Pakistani sensibility. Nahida Khan and Javeria Khan’s 119-run stand for the second wicket was the core of Pakistan Women’s 212 for 7 after being asked to bat on Wednesday (February 15) at the Nondescripts Cricket Club ground in Colombo. Sri Lanka Women replied with its own opening partnership of 75 at a healthy 4.8 an over to set the tone. A timely 65 not from Eshani Lokusuriyage then took it past the line to 216 for 5 in 47.4 overs and an exciting three-wicket win to open its ICC Women’s World Cup Qualifier Super Six campaign. Lokusuriyage, who came in with the team in a tricky position at 102 for 3 in the 24th over, made sure the required run-rate never got out of hand. As impressive as her eight boundaries – the last of which brought up the win – was her ability to rotate the strike during a 75-ball 65. She and Prasadani Weerakkody (45) added 88 for the fourth wicket, taking the team all the way to 190 with nearly nine overs left to knock off the remaining runs. Pakistan fought back with a couple of quick wickets, but there was to be no twist in the tale. 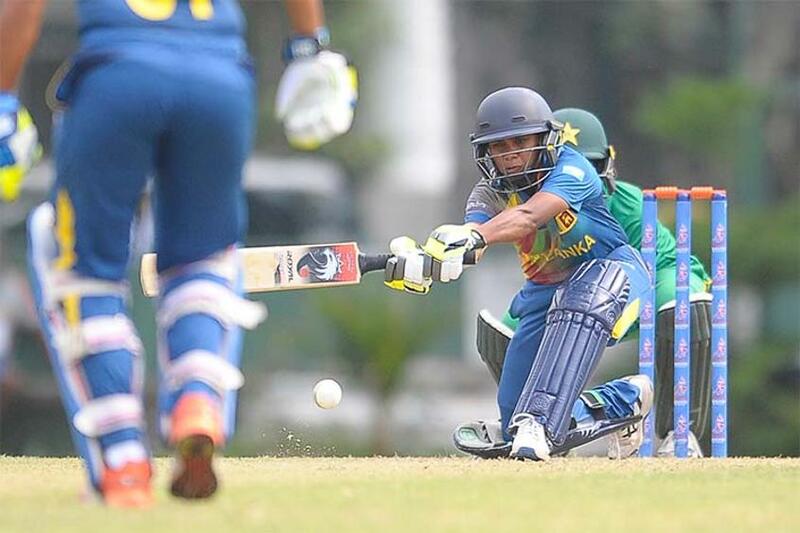 Chamari Athapaththu began Sri Lanka’s chase with a couple of fours on either side of the wicket, and Nipuni Hansika (37) soon joined her in scything through the field. The opening pace and spin combination did little to throw off their rhythm. Nashra Sandhu (2 for 37), the left-arm spinner, who had been taken for three boundaries in an over, returned for her second spell to have Athapaththu bowled in the 15th over. With Hansika, too, gone for another 30-something score, falling lbw to Ghulam Fatima (2 for 28), the innings could have been robbed of momentum, but the Lokusuriyage-Weerakkody combination ensured otherwise. Earlier, Sripali Weerakkody had got a breakthrough in the second over of the day, beating Ayesha Zafar’s defence to have her bowled and giving her a cheeky send-off. But that was the only relief for the home side until the 30th over, despite its best efforts on the field. Nahida and Javeria didn’t take too many risks, keeping the scoreboard ticking with excellent running between the wickets. Bismah Maroof and Javeria share as good an understanding in the middle and looked confident in charging down the pitch. Sri Lanka got a boost when they both fell in consecutive balls. Though Pakistan lost regular wickets thereafter, it managed 30 runs in the last five overs. In the end, it wasn’t enough. Sri Lanka next takes on South Africa Women at P Sara Oval on Friday, with the match live-streamed. The host is now on four points, while Pakistan, on two, faces Ireland.